with feta and rocket on sour dough toast. I can't help to keep returning to this colourful and delicious pate. I guess its both those things and the texture of the rocket with the little black nigella seeds contrasted on the white of the feta. Truly a visual feast as well as devouring its delicious flavours. Slowly add the cider vinegar - to make a smooth pate. Be careful not to add too much - because it'll become too liquid. Season to taste - add more maple syrup or cider vinegar and a little salt if needed. 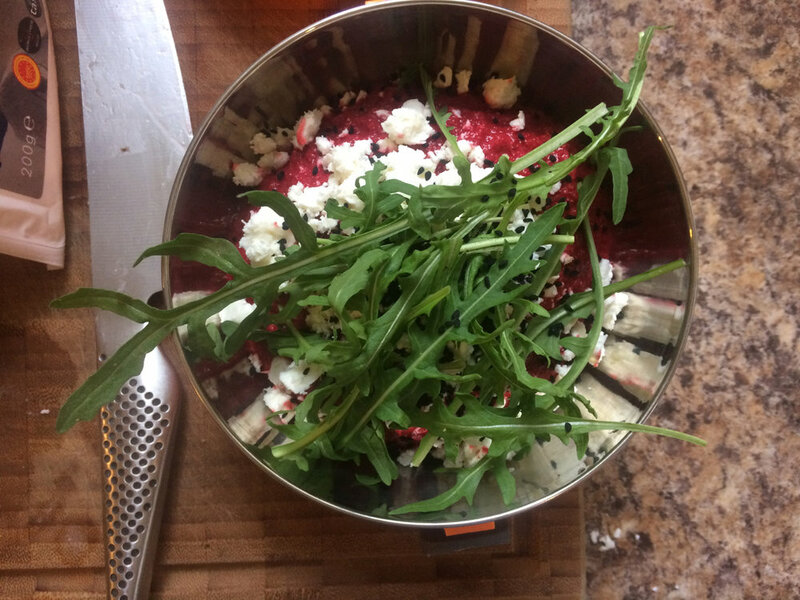 Toasted Sour dour goes really well with this - crumble feta over top and sprinkle nigella seeds, add a little rocket and drizzle with olive oil if you have some. - Enjoy!